Avenel, N.J.: Wings Books, 1993. 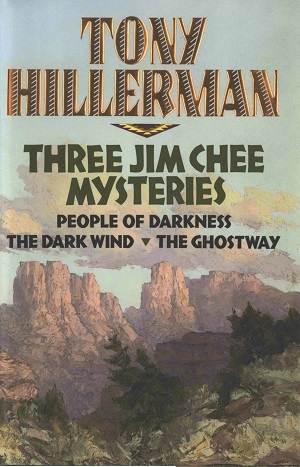 This is the Wing Book hardback edition of Three Jim Chee Mysteries: People of Darkness, The Dark Wind, The Ghostway. This edition was published in 1993 by Wing Books, an imprint of Random House Company, in Avenel, New Jersey. This anthology covers the first three appearances of Officer Jim Chee as the main character and includes the books: People of Darkness (1980), The Dark Wind (1982), and The Ghostway (1984). The jacket painting adapts a landscape painting from "Western Artist" Bill Freeman. The painting features a scene with gathering clouds above a canyon which is surrounded by shrubs and trees. Format: Hardback, 24 x 16.5 cm. Binding: Green boards with a tan cloth spine. The author, titles, and publisher are printed in metallic copper on the spine.